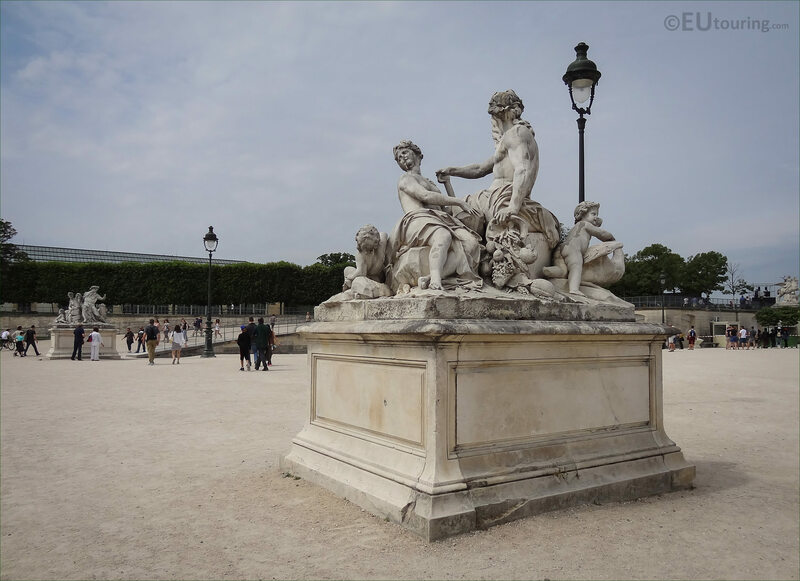 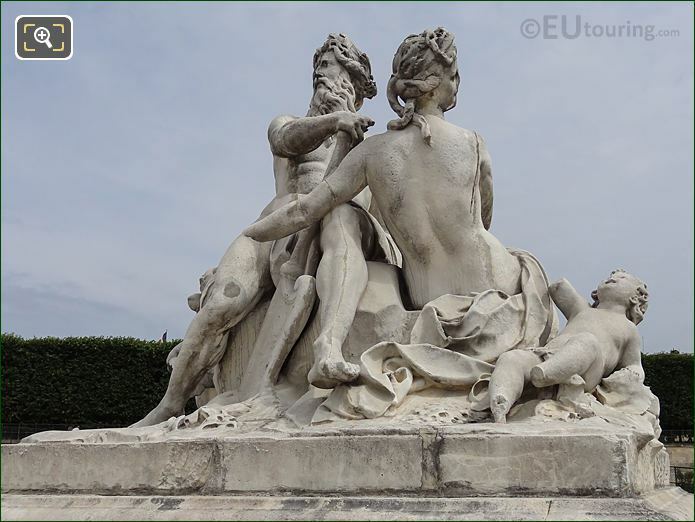 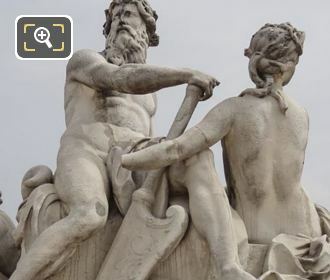 We were in the 1st Arrondissement of Paris at the Jardin des Tuileries, when we took these high definition photos showing a statue called La Seine et la Marne, which was sculpted by Nicolas Coustou. 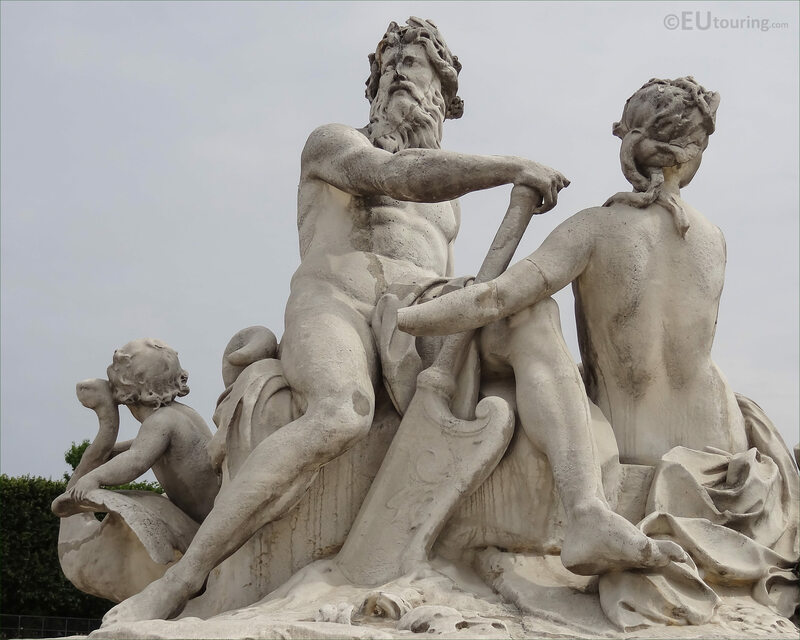 This first HD photo shows a statue group called La Seine et la Marne at the Jardin des Tuileries, which was designed to represent two of the rivers in France of the River Seine and the River Marne, and was designed to go alongside the statue you can see to the left of the image being La Loire et le Loiret, sculpted by Corneille van Cleve. 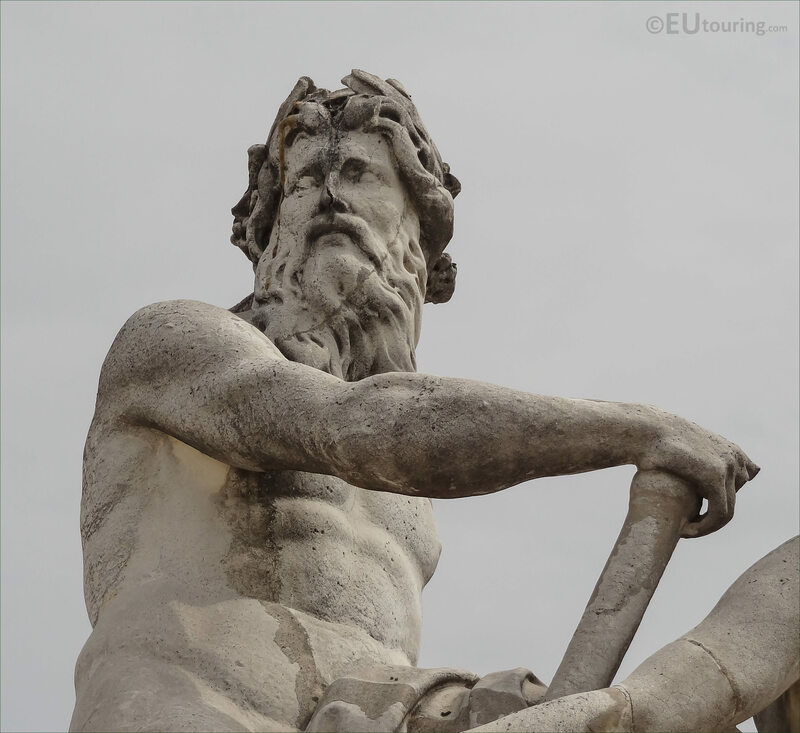 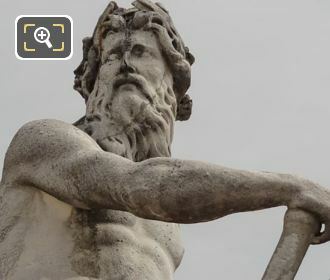 Here you can see a close up photograph showing the features of the elderly man with his right hand leaning on either an oar or a rudder, which is one of the allegorical features designed to portray the wealth of the country through its river commerce. Now it was actually during the reign of King Louis XIV that statuary started to appear at royal residences in France, and this was when the Colbert Prize and the French Academy in Rome was set up for artists to study ancient sculptures, especially those of the Vatican, yet this king also introduced other things to France including swans, and here you can see a young child playing with a swan within this statue group. 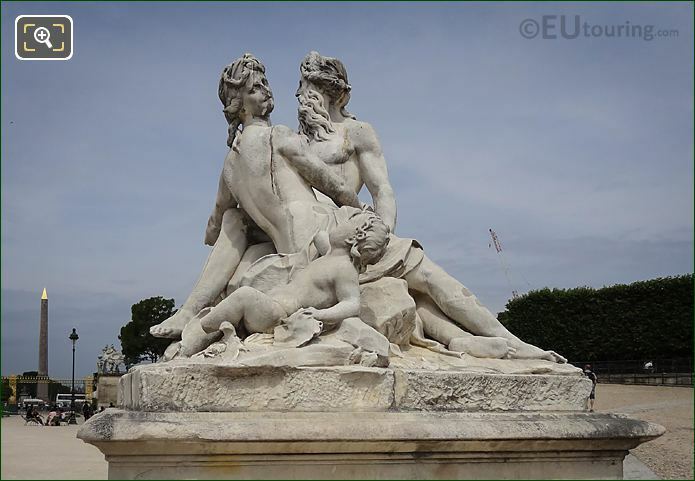 La Seine et la Marne was originally produced as a plaster model in 1699 by Nicolas Coustou, who was born in Lyon in 1659, yet moved to Paris to study to become a French sculptor under his uncle Charles Antoine Coysevox, winning the Colbert Prize in 1682, which became known as the Prix de Rome later, yet this allowed Nicolas Coustou to further his studies in Rome, Italy. 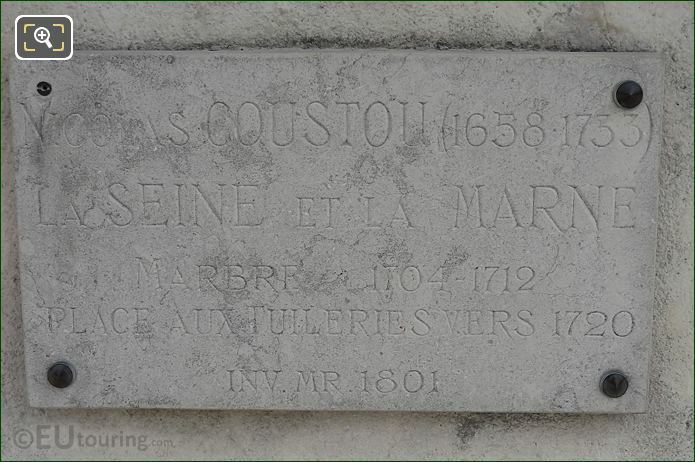 Once the plaster model had been approved by King Louis XIV, work started on producing the marble statue group of The Seine and the Marne, which was sculpted by Nicolas Coustou using Carerra marble in a way that the statue could be viewed from all sides, as this was destined for the park of the royal residence called the Chateau de Marly, where it remained until 1720. 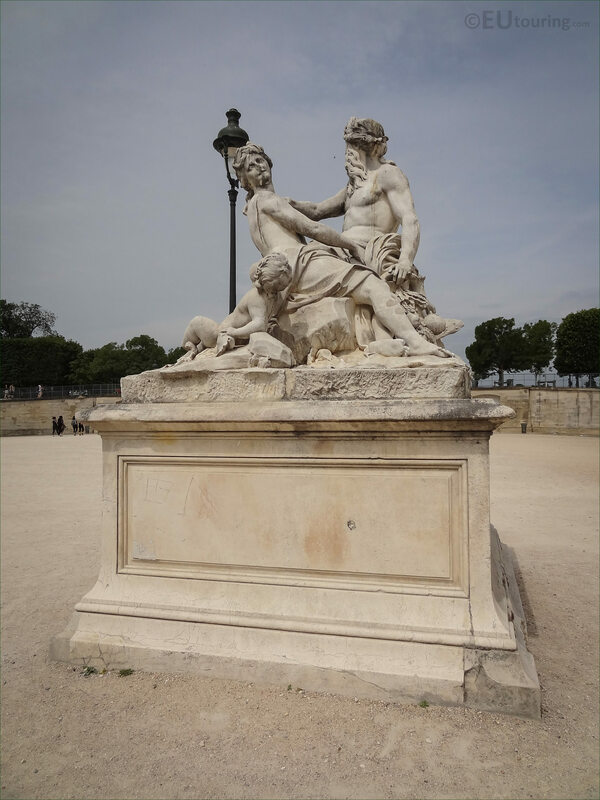 However, in 1720 The Seine and the Marne statue group was removed from the Marly park and brought to the Jardin des Tuileries and placed close to the western entrance of the garden close to the Place de la Concorde, which has the Luxor Obelisk in its centre, that you can see in this image. 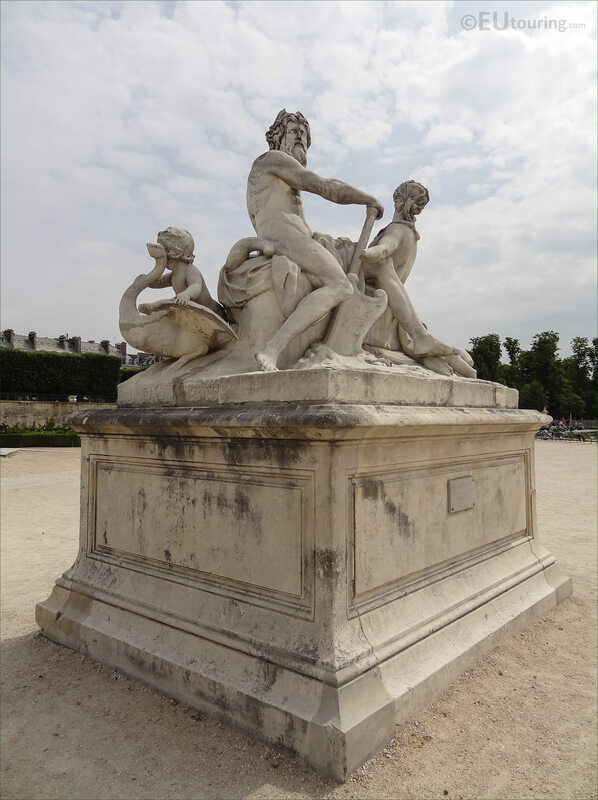 But being such an old statue group and classed as an historical monument in its own right, La Seine et la Marne was actually removed from the Tuileries Gardens in 1993 to be preserved within the famous Musee du Louvre, and this was replaced with an exact copy or cast. 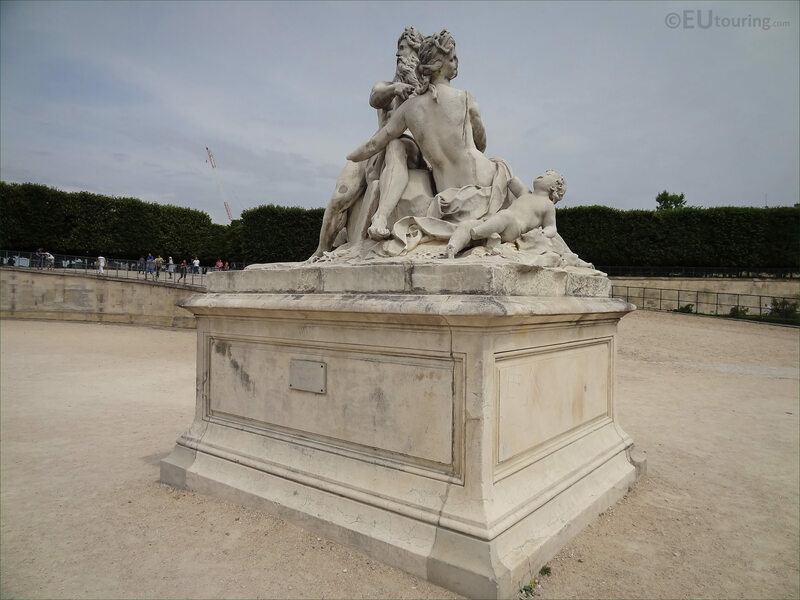 The original is now on display within the Richelieu Wing of the Musee du Louvre in a dedicated area called the Cour Marly, so named after where this statue originated from, but for those of you not fortunate enough to go inside the impressive museum, you can still get to see the copy within the Jardin des Tuileries in an area called the Fer a Cheval. 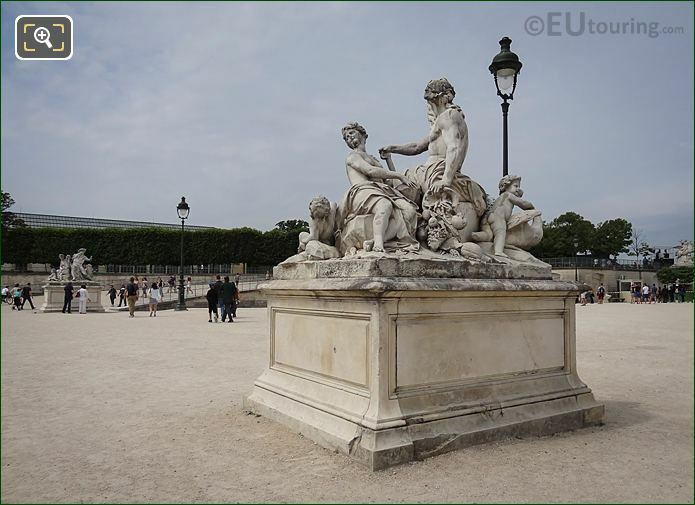 The original was restored between 2004 to 2006 through the patronage of Pari Mutuel Urbain, yet as you can see from this photograph, there are parts of the statue group in the Tuileries Gardens missing, such as the left hand of the female figure, which is how the cast or moulding was produced from the original Carerra marble. 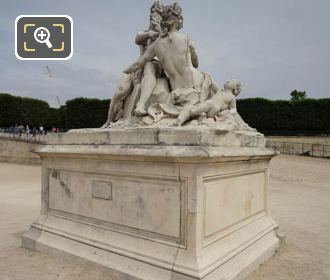 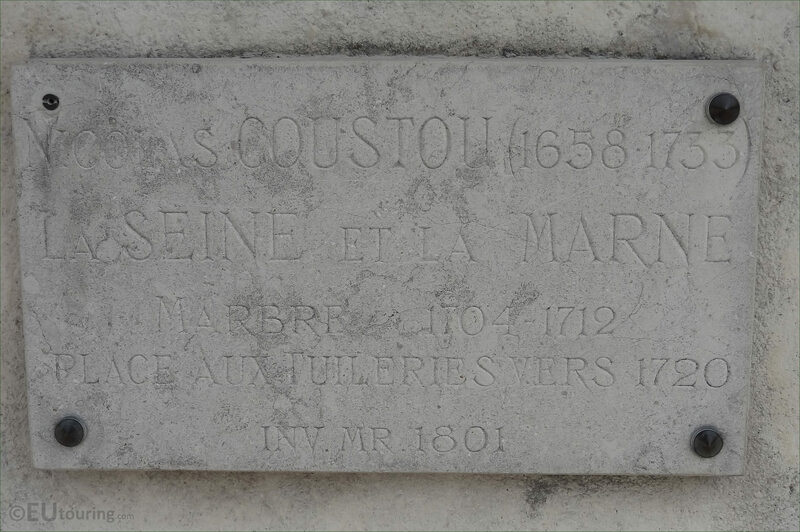 But here you can see the plaque located on the large pedestal base of this allegorical statue group, which shows an Inventory Number of MR 1801, plus when the marble was first produced, which according to the Musee du Louvre is actually on the marble statue of La Seine et la Marne, yet there are conflicting dates, because in their inventory list it states from 1701 through to 1712, whereas this tourist information plaque shows a start date of 1704. So as we mentioned before, The Seine and the Marne statue group by Nicolas Coustou, also known as Nicolas Coustou the Elder due to having a younger brother who was also a sculptor, is positioned in the Horsehoe area of the Jardin des Tuileries called the Fer a Cheval, which is by the right hand side ramp that leads up to the terrace where you can find the Musee du Jeu de Paume on the side of the Rue de Rivoli in the 1st Arrondissement of Paris.